I love eggplants and steaming might be my favorite way of cooking eggplants. Steamed eggplants are especially nice to serve cold with simple sauce so that your palate can focus on the delicate texture and flavor of the vegetable itself. 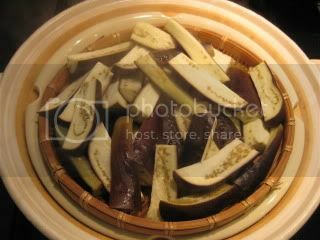 With my donabe steamer, "Mushi Nabe", because of its intense steam, a pile of cut eggplants can be steamed really nicely. This salad dish is a true delight. It's steamed Japanese eggplant with roasted walnut & miso sauce. 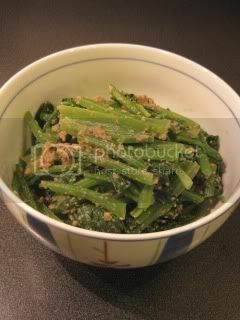 This shojin (Buddhist temple-style vegan) dish is so satisfying, yet no oil is used in it. 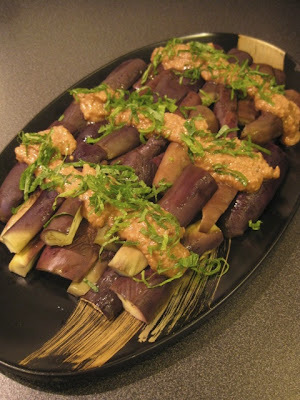 Both the eggplants and the sauce can be prepared 1 day ahead and assemble right before service. 1. Cut off the head of each eggplant. Cut each into quarters. For a very long eggplant, cut each piece further into half crosswise. Soak them in cold water for 5-10 minutes. Drain and set aside. 2. Get donabe steamer, "Mushi Nabe"ready. Set the eggplants on the steam grate. Cover and steam over high-heat for about 10 minutes or the eggplants are soft. *For easy removal I use a shallow bamboo basket to steam eggplants. I can just pile up the eggplants in the basket and set it on the steam grate. When the steaming is done, I just remove the whole basket. 3. Transfer the eggplants into a plate and let them cool down. Once the eggplants are cooled, chill them in the refrigerator. 4. To make the sauce, add all the ingredients for the sauce in a food processor and make into a puree. Add more dashi stock according to your preferred consistency. 5. To serve, arrange the eggplants in a plate and pour the sauce. Garnish with sliced shiso leaves. This dish is great as an cold appetizer! The sauce is very versatile. 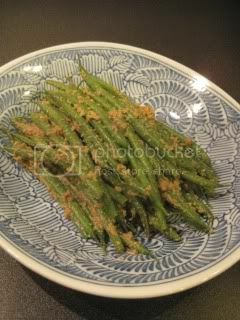 These are a couple of variations...one if with Haricot Verts, and the other with blanched Komatsuna (Japanese spinach). I just tossed the ingredients with the sauce!